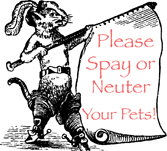 Spay & Neuter Your Pets, Please! Right now Im faced with six mama cats, their litters and four toms which all are going to have to be caught, fixed and either released or find homes for them. (Please, check out the great links on this subject at bottom of page). of year, I will undoubtedly be the feeder to most of these cats after theyre spayed and neutered. But it is someones problem when those cats have kittens and those kittens have kittens, and so on and on and on. Where can I find my next meal, where to shelter my babies, how can I protect my babies from harm? Someone once noted that the way a civilization treats its animals is a sign of the decline of that civilization. When we take an uncaring attitude towards our animals, then we are on a downhill slide! Please, help by not being the source of the problem. There are wonderful groups all over the country that work to control the feral cat populations in their areas. Find one in your town and support their efforts. They deserve the helpeven if it is volunteering when they have a spay-neuter clinic or help promote their fundraising events. Just help control the stray cat problem! Click here to support Spay Neuter Programs. Community Cat Care.